On Wednesday 7th March, the Royal Pavilion & Museums hosted Queer Legacies, a one-day conference commemorating the 50th anniversary of partial decriminalisation of homosexuality in the UK in 2017. 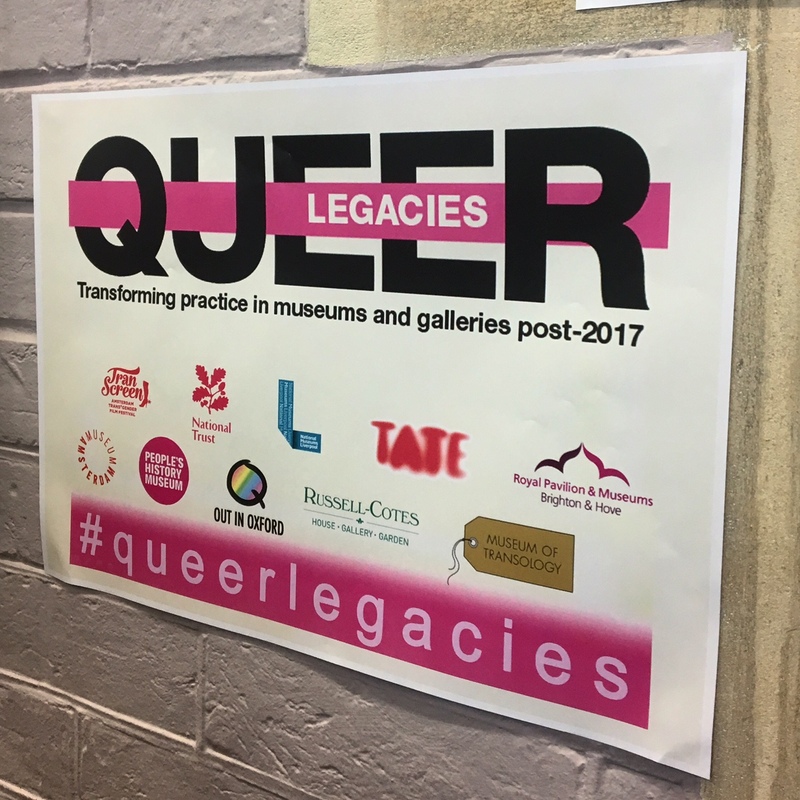 The event explored the extent to which LGBTQ collaborations and events in the museum and gallery sector during 2017 created a permanent legacy, addressing challenges and successes. Next came Mirjam Sneeuwloper and Maik Mirkovic speaking about Transmission (2015-16) and Trans*Objects (2017) at Amsterdam Museum, both exhibitions that were important because not only did they invite the public to come, view and learn, but they entailed a process of inclusiveness with their involvement of various transgender communities, networks and individuals. Maik spoke about their involvement with TransScreen, Amsterdam’s trans* film festival, and Mirjam spoke about the importance of ‘inreach, not outreach’ when collaborating with queer communities; ‘outreach’ implies that we are approaching with a pre-empted agenda, when really, what we must do is flip the script and invite people to come and educate us. “Museums aren’t open spaces. If we don’t show certain stories, we say as much as if we do” – a poignant quote from Mirjam. 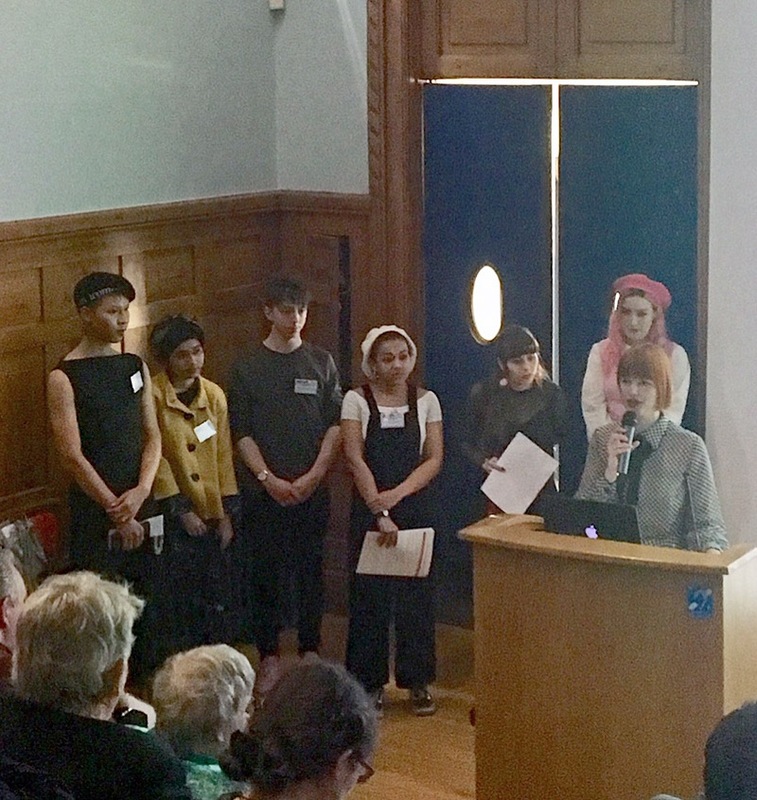 Next we enjoyed a talk from our very own Queer Looks Young Project team about our upcoming exhibition and the trials and tribulations that they’ve faced so far in helping to curate it. 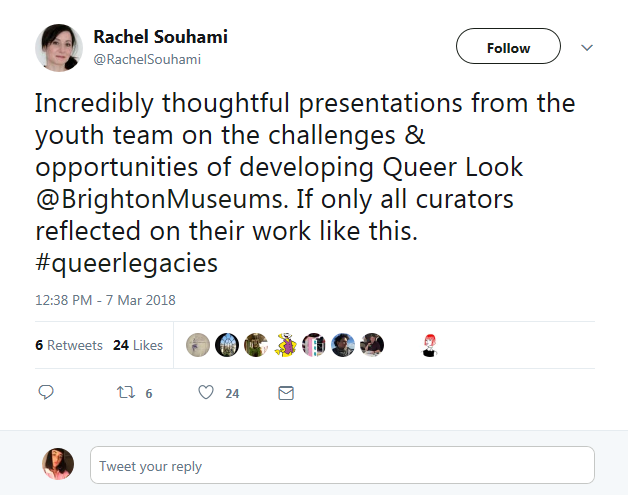 Ellie praised the project for enabling external exhibition participants to feel comfortable and welcome on entering Brighton Museum & Art Gallery, sometimes for the first time ever (“We’re young and part of the community, so not intimidating”). Despite a large and somewhat intimidating audience, the group dazzled, articulated themselves beautifully and did us very, very proud. We weren’t the only ones impressed by their performance, either! After a panel discussion, a ridiculously tasty lunch and an opportunity to mingle in Brighton Dome, we settled back down to a talk from Tom Freshwater on the National Trust‘s Prejudice & Pride, a year-long exploration of LGBTQ heritage across the National Trust’s properties and the first in a series of National Trust Challenging Histories programmes designed to actively challenge, unpick and look again at the histories curators inherit. ‘The exhibition about being gay was very moving. My initial reaction was one of shock, which made me think about how cruel we have been and still can be to gay people… Well done to the National Trust for allowing what some may think was a controversial subject,’ was one piece of feedback received. 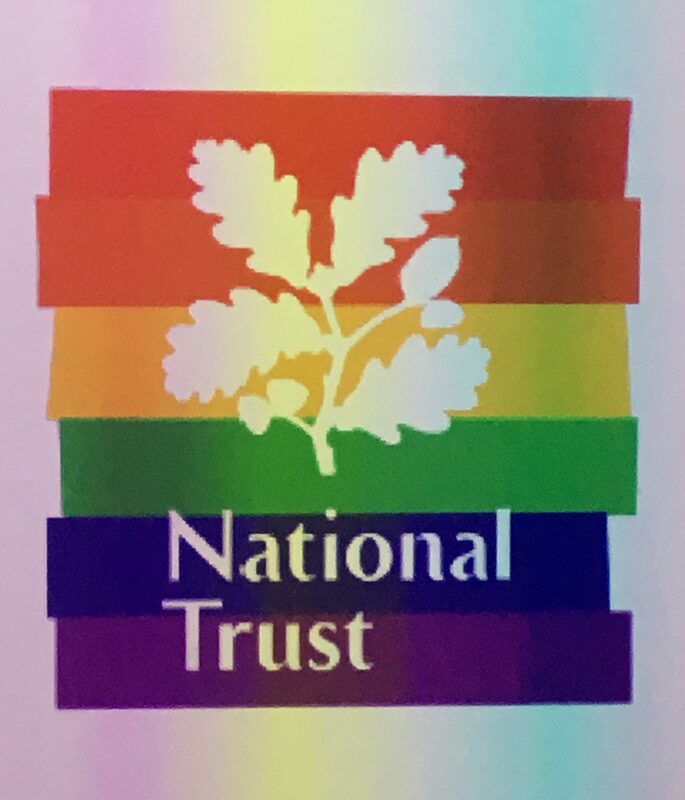 Tom described the National Trust as “a national voice for contemporary debate”. 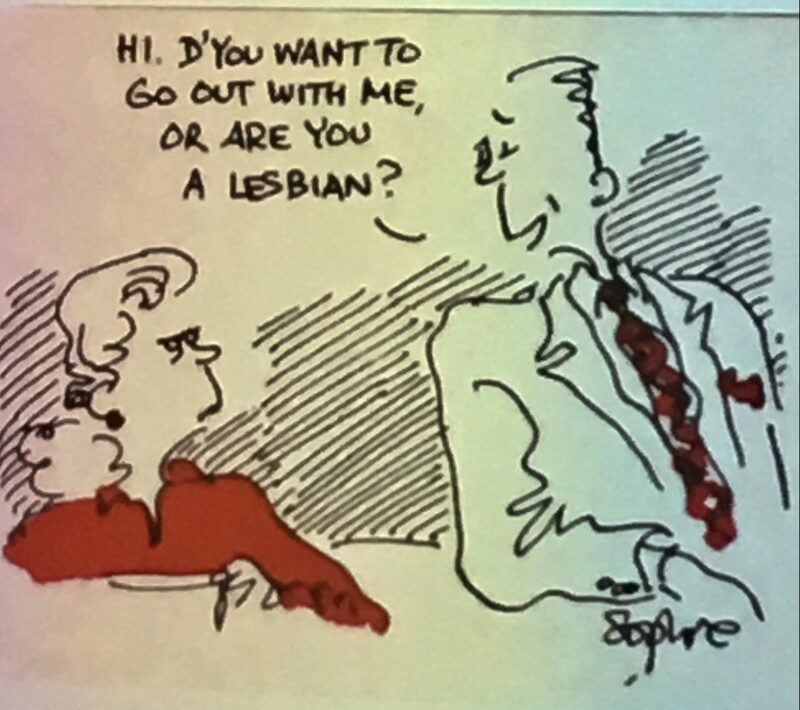 Then came Beth Ashbury, Dr. Clara Barker and Jozie Kettle on Out in Oxford, an LGBTQ trail of the University of Oxford’s collections, developed in response to Professor Richard Parkinson’s call for more explicit, not implicit, LGBTQ representations in museums. 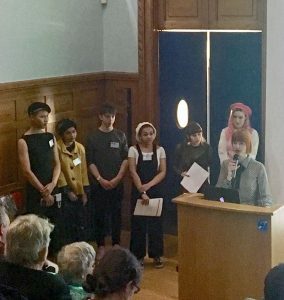 Trans activist Clara spoke about the misguided and harmful representation of trans people in the media and the importance of community engagement and involvement in making queer histories visible in museums and galleries. “Museums are powerful,” Clara reminded us. 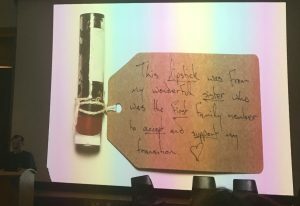 “Our history is there.” Oxford’s Pitt Rivers Museum believe that every museum should have at least one LGBTQ object in their permanent collection. Next, we heard from National Museums Liverpool‘s Charlotte Keenan on Pride & Prejudice: Bringing Stories out of the Closet, a project revealing the organisation’s approach to retrospectively researching the LGBTQ histories of its collections and how this information has been presented to its audiences. 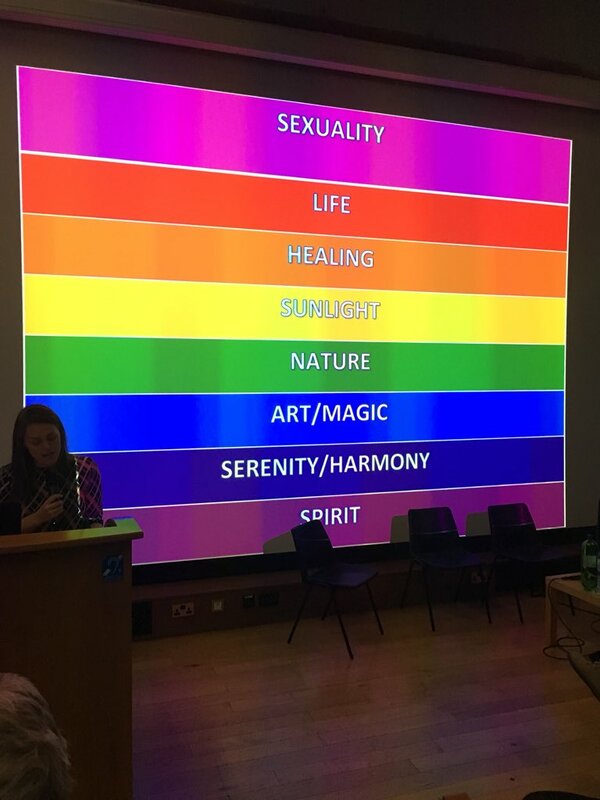 Charlotte also discussed the Walker Art Gallery’s ground-breaking exhibition, Coming Out: Sexuality, Gender and Identity, though “LGBTQ history shouldn’t just be visible temporarily,” she feels. 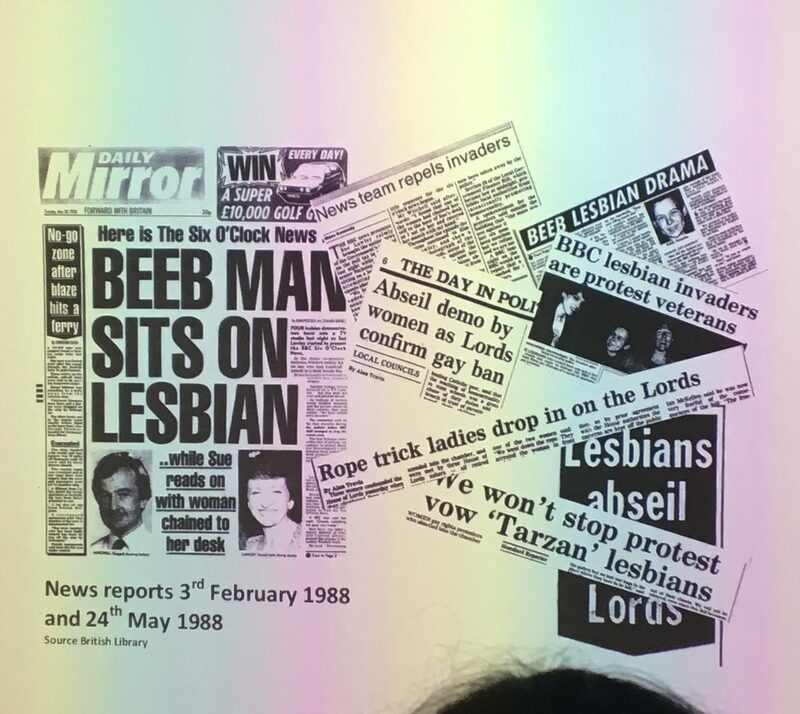 “It should be here all year round.” Charlotte description of the organisation’s careful “unlocking” of their collection’s LGBTQ histories was inspiring for other museum curators in the room. A quick refreshment break and we were seated again, this time to listen to Alice Cox from Bournemouth’s Russell-Cotes Art Gallery & Museum speak about Refracted, a volunteer co-curated exhibition of objects from the museum’s existing collections representing the colours and themes of the rainbow flag that’s been a symbol of the LGBTQ community since the 1970s. 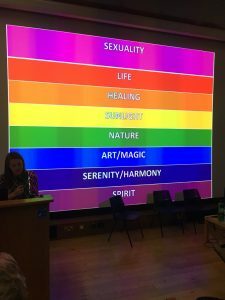 Alice spoke about the benefits of working with the community and the challenges of arriving at an exhibition to commemorate the 50th anniversary of partial decriminalisation of homosexuality in the UK with a collection that isn’t hugely representative of the community. 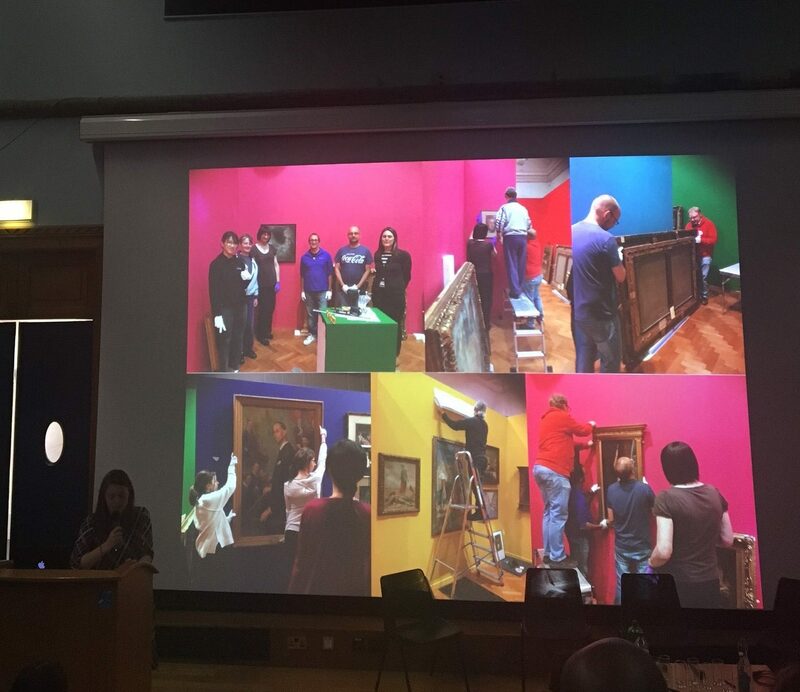 Following Alice were Clare Barlow and Eleanor Jones from Tate Britain, talking to us about the legacy and impact of Queer British Art, the first exhibition in the UK to address the history of queer British art. 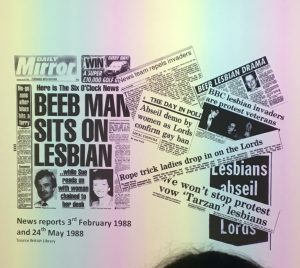 In Clare’s words, the exhibition helped to highlight an important truth: “The past is queerer than we could possibly imagine.” Clare shared some visitor statistics with us, illustrating the exhibition’s phenomenal success. The show earned roughly 140% of its predicted income and achieved 120% of its forecasted visitors, with 93% of those guests rating their experience as ‘good’ or ‘excellent’. 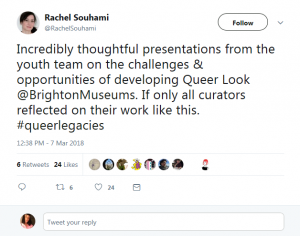 But, despite this particular museum success, Clare still believes that the community are the most important catalyst for uncovering queer history and leaving queer legacies. “We need to be thinking about what we as a community can add,” she stressed. 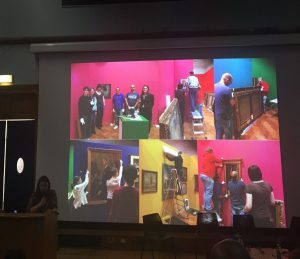 “Because if we’re waiting for the museums then we could be waiting for a very long time.” Eleanor spoke engagingly and creatively about Duncan Grant pieces used in her PhD and in the Queer British Art exhibition. 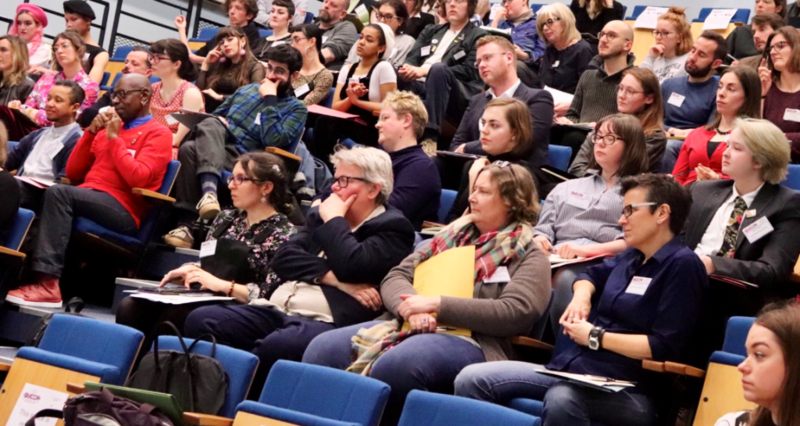 Thank you so much to everybody who joined us on the day, whether sharing with us their knowledge and experience from the lectern or listening and learning from the other side of the room. The day was a huge success; inspiring, thought-provoking and moving.